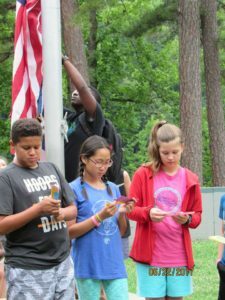 Campers at Penn 4-H Camp start and end each day of camp with the traditional flag raising and lowering ceremony and a thought for the day. Sarah Wilson (right), a Catawba County camper, prepares to read her encouraging thought during the flag ceremony. With a few warmer days, some families are planning for summer and I am excited to be receiving several inquires about 4-H summer camps. NC 4-H operates three camps located in various regions of NC including Millstone 4-H Camp in Ellerbee, Eastern 4-H Center near the coast, and Betsy-Jeff Penn 4-H Center in Reidsville. You can view pictures and learn more about camping programs at each of the facilities at www.nc4h.org. Participants from Catawba County will be camping at Betsy Jeff Penn 4-H Camp the week of July 8-13. Penn offers a traditional camp program that includes high and low ropes course, swimming, canoeing, environmental science, special evening programs each night, horses, and an outdoor overnight camping trip for older campers. Penn accepts campers ages 8-14 and it is not necessary to be in 4-H to attend the camp. When children attend camp with the county group, they travel to the camp together with transportation provided to and from Newton. A week of camp can create life-long summer memories, while helping children build skills enabling them to be more successful students in the upcoming school year. A new study just released from the NC Youth Camping Association and conducted by Clemson University, found that 91% of the parents of campers associated the camp experience with school success. Parents reported seeing improvement in skills in cooperation, communication, critical thinking, resiliency, and decision-making after attending camp. A quality camp program (like NC 4-H camps) will add to a child’s social, emotional and character development, as they experience camp activities like canoeing, ropes course, and cabin life. All NC 4-H camps are accredited by the American Camping Association indicating the camp has met certain safety, programming, and fiscal management standards. The cost to attend Penn 4-H Camp is $435 which includes all camp fees, t-shirt, store money, transportation and insurance. A $200 deposit is due at the time of registration with the full balance due by May 15. Scholarships are available and provided by Hickory Kiwanis Club and Hickory American Legion, based on financial need. Scholarship applications are due March 20. Contact Cooperative Extension at 828-465-8240 or donna_mull@ncsu.edu to request a camp registration form or scholarship application. Scholarship applications are also posted in the 4-H section on the Cooperative Extension website at https://catawba.ces.ncsu.edu. Catawba County 4-H Club members that completed project books can also qualify for discounted registration. If families wish to send a child to 4-H camp, but they are unable to attend with Catawba County, you may also select the camp and week of choice and register independently though the NC 4-H website. In addition to the traditional camp week, NC 4-H also offers a variety of specialty camps. The Eastern 4-H Center offers Marine Science and Sailing, Camp Canvasback, and Target Sports with all of these designed for older campers. Millstone 4-H Camp offers Deaf Camp, Horsemanship Camp, Mini Shooting Sports Camp, Cloverbud Camp, and the ever popular Fur, Fish and Game Rendezvous. Families may register children for these specialty camps through the NC 4-H website. 4-H is the youth development program offered through Cooperative Extension. For more information about summer camps or other 4-H opportunities contact the Catawba County Cooperative Extension office at 828-465-8240.